Generally, engineers choose pipe diameters and flow velocities which minimize the total cost of the pipeline over the whole pipeline lifecyle. The total cost is the sum of the capital costs and operational costs. This Excel spreadsheet calculates the least total cost pipe diameter and flow velocity for a pipe, given the desired construction material, flowrate, viscosity and density. The calculation is iterative and uses Excel's Goal Seek Functionality. 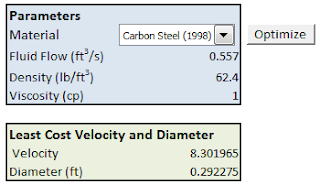 The spreadsheet enables you to choose from empircal cost parameters for 1998 and 2008, for a range of materials. Generally, least-cost flow velocities have decreased over time because energy costs have increased.